Digital Citizenship and Cyber Wellness Olympiad 2017,Register at LearningOlympiads Website for DCCWO Test/ DCCW Olympiad Test,DCCW Digital Citizenship and Cyber Wellness Olympiad Test 2017 -LearningOlympiads ~ LLF. 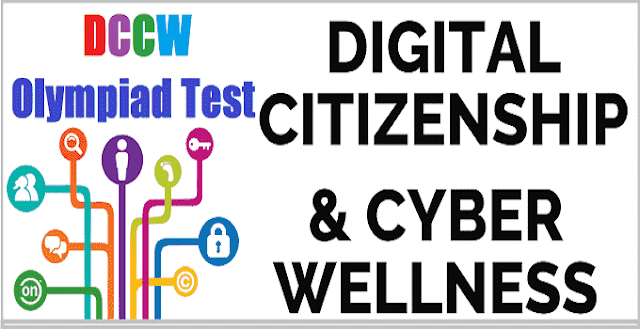 Digital Citizenship & Cyber Wellness Olympiad: In recent years digitization is no more confined to controlled laboratory but have started addressing real world scenarios and situations. The rising interest in digital world stems from the fact that all small and big tasks require digitization. Digitization is everywhere – the car we drive, the phone we use etc. Everyone is keen to invent and use new technologies. But everyone who uses technology – is he a good digital citizen? Just as we know the rules of the society, we must know rules of the digital world, how to be safe and responsible with technology. The importance of being a responsible digital citizen can be gauged from the fact that most of the companies’ major concern is cyber security, individual’s major threats are identity theft and many more. The main objective of Learning Olympiads on Digital Citizenship & Cyber Wellness is to make our future generations a leader of Digital India. It aims to inculcate interest in students about working safely and responsibly on internet and create a safe learning and sharing web environment for everyone. They must know how important and crucial it is to head responsibly towards automation and digitization. The Olympiad is open to students, educators and anyone, who is interested in learning to be Cyber Safe, across India. The Olympiad encourages and promotes them to emphasize on the logical application of their knowledge base to move towards digital India. This Olympiad is not about participation only from the toppers or super tech-savvy but can be participated by anyone who understands logic of using technology. It does not focus on marks and ranks but is more about promoting sustainability, it is about making each child of the school a responsible Netizen. With the advent of one-is-to-one teaching with technology and cashless economy and several other e-initiatives of our government, it further pushes all of us towards using on-line resources more responsibly and efficiently. Not only organizations, but there are individuals as well who are taking interest in the topic and working towards making the digital world a safer place. Learning Olympiads: ‘Learning Olympiads’ – a series of Olympiads – is an initiative by Learning Links Foundation focused towards helping students and teachers to learn willingly, assess and apply their knowledge and skills, in turn get motivated and recognized at various levels. We wish all participants to Engage, Evolve and Express. These Olympiads are aimed to encourage students to participate in the learning process meaningfully with a renewed sense of self belief and self-confidence. The Olympiads aim at promoting science, mathematics, computer education, cyber safety, sports, natural capital resources, financial literacy and many other topics encouraging students’ participation and infusing a healthy competitive spirit. Students are the future of our country and it is pertinent to think and make them future ready – a future in which the children of the present shall be the leaders of tomorrow. Regular qualitative and quantitative assessment needs to be done at the national level in order to build their talent pool. Through Olympiads, LLF is driven to provide a platform to identify such talents in students and teachers, test their aptitude, sharpen their innovative skills, align their intellectual goals with a social cause, inspire them and accolade them at various levels. These Olympiads strive towards development of 21st century skills among students comprising collaboration, cognitive/critical thinking and communication skills including technology aligned with key life skills defined by CBSE. Olympiad syllabi is designed to keep you safe online & make globally responsible netizens. It is not about focusing on ranks and marks but learning to sustain safety in the digital world. The Olympiad is open for:Government and private schools across all boards (central and state) pan India (Across all States) at 3 levels i.e. OTHERS- Anyone interested to learn to be safe online may apply tooVisitwww.learningolympiads.co.infor more..
Do you study in class 3-5 anywhere in India? YES!! You are on the right page. We want you to be safe while using Internet – do you wish to know HOW? Let’s begin. Journey begins: You need to REGISTER yourself first and complete your profile. Hope your teacher or parent is sitting along with you to make online participant fee payment link to payment gateway. Go through interesting learning material to prepare for the Olympiad test. Practice by giving MOCK tests first and VOILA! You are all set to take final test and get your certificate. Get recognized: you may feature on our website soon and/or be part of ACHIEVER’s CLUB. This page is meant for students studying in class 6-12 in any school across India. Stay safe: Objective is to learn nuances of staying safe while using internet – learning material and the Olympiad test will help! Journey begins: You need to REGISTER yourself first and complete your profile. Ensure your participation by making online payment towards nominal participation fee through PayTM. Learning material: Go through interesting learning material to prepare for the Olympiad test. Mock tests: Practice by giving MOCK tests first and VOILA! You are all set to take final test and get your certificate. This page is meant for Educators teaching any subject from K-12 in any school. Objective: Objective is to learn nuances of staying safe while using internet – learning material and the Olympiad test will help! Others: Any Individual: This page is meant for anyone in India who is interested to work with safety harness while working on the net which is part of our daily life today. Educators:Educators can register themselves under educator category. Schools:Schools can register students and educators through bulk registration. Would you like to sneak peek into the learning material available on the website? Please click on SNEAK PEEK at www. learningolympiads.co.in to review some part of the learning material for your ready reference.To be able to view complete learning material, please complete your profile and make fee payment. How to Access Learning Material :Complete learning material is available on the website to help you with test preparation. You can view and read the material once you have successfully registered and paid participation fee. Go to your DASHBOARD and click on ‘LEARNING MATERIAL’ to access. The mock test is available on the website to prepare you for final test and manage your test time of 60 minutes effectively. You can take mock test as many times as you want. Mock test can be taken once you have access to your ‘DASHBOARD’.Tip:1. Practice to increase your answering speed.2. Get to know the type of questions that willbe asked in final olympiad. These Olympiads/Contest will be held through a robust website and all activities pertaining to the Olympiad i.e., registration, unique ID generation, submission of application, accessing information on Olympiad, content based random generation of question paper, mock test provision, auto responses, reference material, updates, announcements, viewing feedback, photos and videos and much more would be available on the website. We at LLF(Learning Links Foundation), consider this initiative a CAUSE because the world is moving into an age of openness and transparency through technology based process. Thus, we encourage each citizen to participate in adopting, adapting and automating simple tasks as fundamental principles of learning thereby opening more job opportunities for our future generations. Since we are entering into a digital era, we would like to make a contribution towards making future generation smart and responsible Netizens. With this vision, we are introducing ‘Digital Citizenship & Cyber Wellness Olympiad’ as 1st in the series of ‘Learning Olympiads’ by LLF.